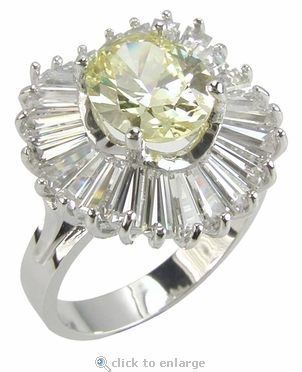 This classic Oval Cubic Zirconia Ballerina Baguette Cluster Ring features a 1.5 carat 9x7mm oval center with an undulating wave of baguettes that encircle the yellow canary diamond look oval cubic zirconia center stone. The oval center stone features 58 sparkling facets and its shape adds the illusion of length to one's fingers. This ballerina cluster ring makes for a great cocktail ring or right hand ring. The original Russian formula cubic zirconia baguettes are all hand cut and hand polished for the highest quality available. 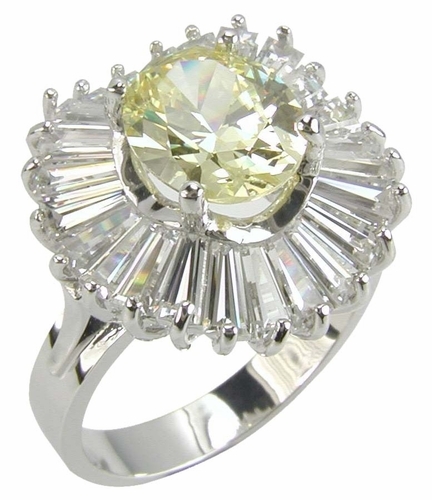 The oval cubic zirconia center stone in this ring is pictured in a canary diamond yellow color and is also available in a man made blue sapphire colored. 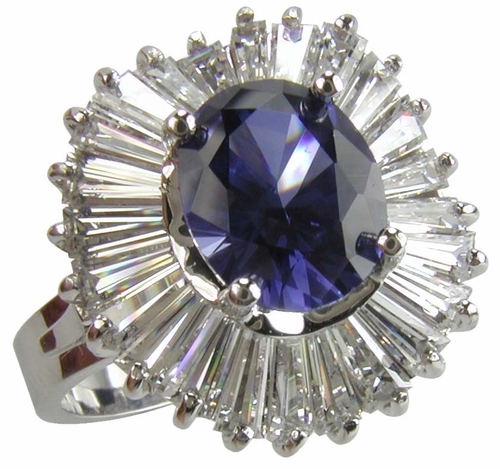 The total carat weight is approximately 3 carats of the finest diamond simulants. Due to extremely low pricing, all clearance sales are final.